Charming Artist Keeps Shoulder and Talking on Phone, Writes Pen on Pad in Art Studio. Girl Artist Holding Mobile Phone and Use, Talking, Writing Pen on Board With Leaves and Smiling, Standing in Art Studio. Charming Artist Draws Picture Uses Brushes With Oil and Listening Music on Headphones Through Phone, Works in Art Studio. Charming Artist Woman Smiling at Camera With Brush in Hand and Posing in Light Art Studio. 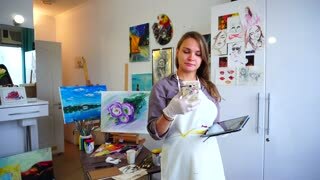 Charming Woman Holding Notepad and Recording Pen, Talking on Cell Phone in Art Studio. Marvelous Artist Talking on Mobile Gadgets and Keeps Record of Pen in Notebook Located in Art Studio. Rear view close up of a female professional creative artist working on her painting finishing her art work at the Art Studio drawing flowers smiling to the camera over her shoulder.